Maritime Vinyl: Disneyland Records, Pinocchio! Back before DVD’s and bluerays were among the first words that children learn to say, they used to get records to enjoy! These records would have dialogue to their favorite movies and stories, or songs from their favorite films! I came across a Disney EP at the thrift store and just had to pick it up to add to my collection. 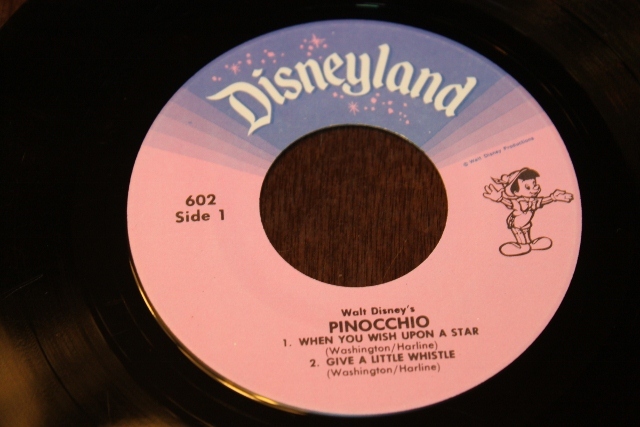 This EP is called “A Disneyland Record – Walt Disney’s Pinocchio – 45RPM songs record”. 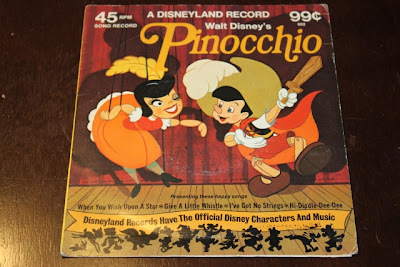 This has a real nice retro look to it with a great drawing of Pinocchio and friend dancing on stage. I loved the hand drawn animation back in the day! So much effort and artistic talent required rather than the now more conventional computer animation. Plus these drawings were all colored in by hand. I hope this retro style of animation becomes popular again in the near future. I have always looked at Disney products as quality products. It appears this was true back in 1978 as well. This 45 is in a nice sturdy heavy duty cardboard sleeve. A lot of pride appears to have been put into this packaging. Disney released records since 1956 on their own label “Disneyland Records”. Only makes sense that a giant like Disney would stop releasing albums through other labels when they have the financial capability to do it themselves. They released a ton of records and I always like to pick up nice copies when I come across them at the right price. I’m hoping when my daughter gets a little older she will enjoy listening to them. Also they look great when they are framed and hanging on her bedroom wall. 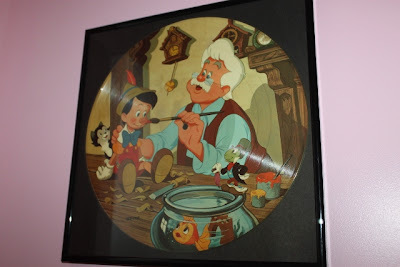 Like this Pinocchio picture disc that was given to me by a friend! She loves this album. She points at it every time we leave her room. Back to the 45 I just picked up. 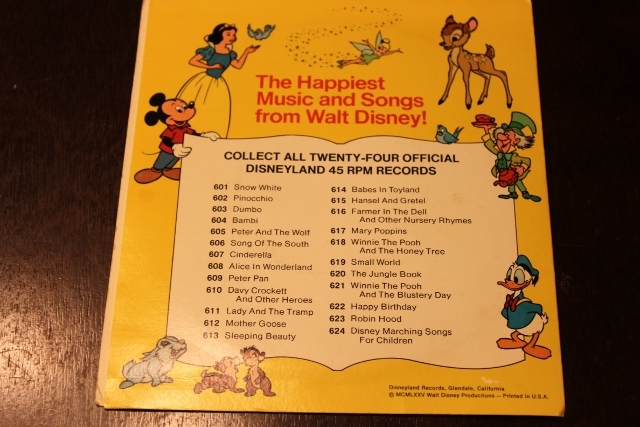 Disneyland records released a set of 24 records in this series. The other titles are listed on the back of this picture sleeve. This is going to look great framed under my daughters picture disc! It’s a great cheap retro piece for the wall, plus it’s another album for the collection! I had a few "Disneyland" records back in my childhood days. Most of them were the "book and record" kind, where you can hear the story and read along as well. And who can forget that wonderful chime that always prompted you to turn the page. That's all I can remember from way back when. None of these records are around any longer, except maybe the "Bambi" soundtrack. A couple of years back one local thrift shop (which I will describe as the "Bloomingdales" of thrift shops) had a handful of Disney pic discs on display but wanted $29.99 a pop for them. WOW. I know they are collectors items and all but a thrift store charging those prices. I passed. I kind of regret it as they are very cool indeed and nice to have. But still too pricey. These LPs bring back memories when I think about them. If I ever see them around, I may pick them up and relive some childhood memories. Great blog post, Brad. I hope some others chime in with comments. * If anyone out there doesn't recognize the name, you can certainly tell his voice. He was the voice of Tony The Tiger (Kellogg's Frosted Flakes) and also the singer of "You're a Mean One, Mr. Grinch"